Since November 2010, TreeSteward Jeff Lund has written articles on what to do with your tree once it is cut down or blown down so it can be recycled. Here is Jeff’s follow-up article to the Storms and Trees article of July 18 that described how a large mulberry tree succumbed to an ice storm and fell on a house. Prior to the scheduled removal, the homeowner contacted me and inquired if this mulberry would be desirable from a woodworking perspective. Normally, mulberries are too small, but the lower portion of this tree had an unusually impressive diameter of 24 inches. Hence, I expressed an interest in obtaining some of the logs for potential woodworking. 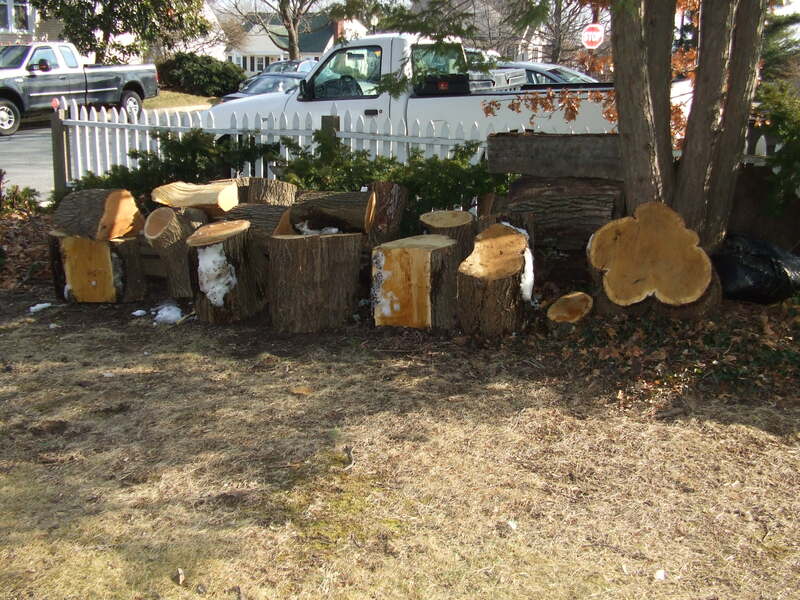 The homeowner instructed the tree removal contractor to cut the lower portion of the tree into logs approximately 18″ in length and leave them onsite. The contractors were pleased to do this, since it saved them the time and energy to move the last 6′ of the trunk to mulch it. Although recycling downed trees as mulch is a desirable outcome, recycling the tree to a higher purpose through woodworking is the preferred recycling option. About a week after the contractor removed the tree, I picked up the cut logs and took them to my storage area (see Photograph at top center). Mulberry is a first cousin to the very hard osage orange and has an almost identical color and figure. To its credit, mulberry is softer and easier to work than osage orange making it more desireable. If the log has sufficient contorted burl-type figure, which is generally present where a lateral branch meets the main truck, then it can be lath turned into beautiful bowls (Photograph to right shows burls in wood). Several of the these logs are destined to be eventually turned into bowls. If the grain is straight and has a pleasing “figure”, then it makes great small handcrafts. You don’t really know what the wood will look like until you open it, so you start splitting and see what happens. This is a win-win process because even if the log does not have woodworking potential, it makes great firewood. Several of the logs that displayed excellent “figure” were subsequently carved into handles such as the “straight shaped” and “fawn shaped” file handles depicted in the photograph. So this mulberry tree’s lifecycle has entailed providing food and shelter for wildlife and shade for the homeowner while alive, to being a victim of storm damage, to recycling into beautiful wood bowls and tool handles. If you are unfortunate and lose a tree you think could be recycled, send an email to info@TreeStewards.org and we’ll try to arrange contact with a woodworker who can recycle like the mulberry. 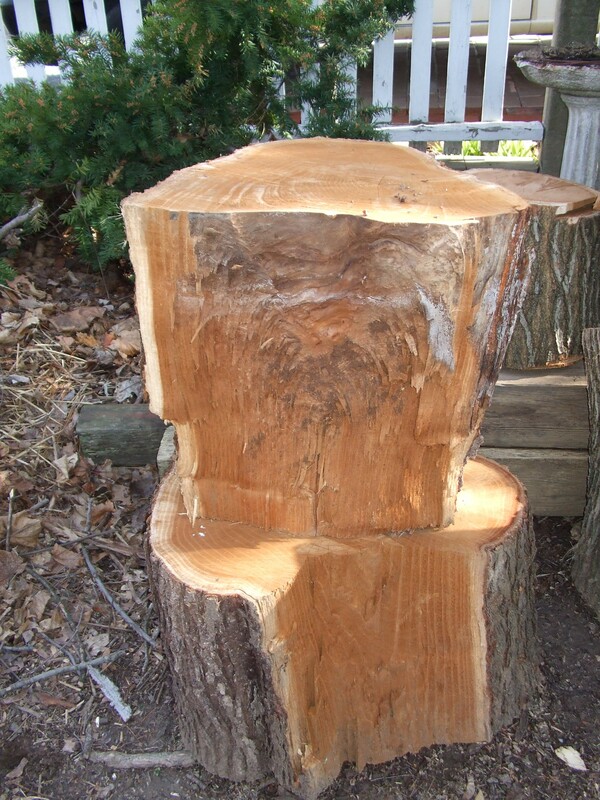 This entry was posted in Advocacy, Education and tagged mulberry, reuse, wood, woodworking. Bookmark the permalink. Now that is awesome!! Well done tree stewards. The “ents” of arlington! !